A friend and I sit at either end of the sofa chattering back and forth, sharing our lives with one another. We talk about our children, our latest home projects, aging gracefully (both physically and spiritually), and recipes we want to try. We talk about our struggles with sin, relationships that challenge us, and what God is teaching us in the midst of our circumstances. We encourage one another to live faithfully, and challenge one another to grow in Christlikeness. In the midst of the chatter about our everyday lives, words of Biblical counsel are exchanged. The root literally means “to call to one’s side;” it is coming alongside someone to give help. While we can exercise parakaleō through counseling, discipling, and mentoring, Biblical encouragement is not only a formal ministry undertaken by those gifted and trained to counsel. Biblical encouragement is the way all believers are called to minister to one another. Encouraging one another in the truth of the Word is not an event to place on our calendar; it is how we serve one another in the midst of the seemingly mundane conversations we share. Opportunities for ministry abound: when we meet with a friend or bump into an acquaintance at the store, during conversations over the dinner table, or through a few hopeful words called out as your children run out the door. YOU are called to be an encourager. Right where you are. To the people with whom you are surrounded. Are you coming alongside others and helping them grow in grace? Are there a few people in your life with whom you share the ordinary stuff of life in order to build a relationship that will allow words of Biblical counsel to flourish? 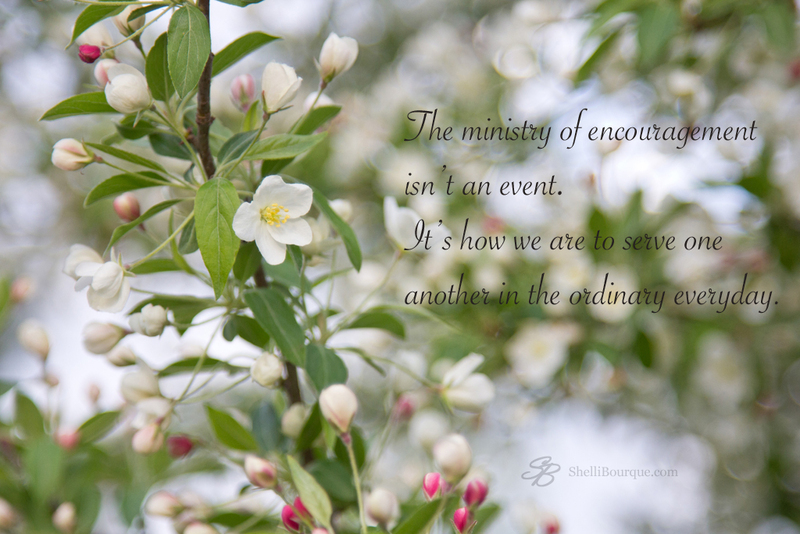 As words of Biblical encouragement are shared, the ordinary suddenly becomes extraordinary. As you minister to one another you tread on holy ground. You’ve reminded me that the supernatural often disguises itself in the natural. Just friends chatting. It’s how an older sister in Christ helped me learn how to be a mom, it’s how an Avon Lady helped me come to know Christ as Savior. It’s how the Holy Spirit spoke to me through them both. Praise Him! In His infinite grandeur, God uses our weakness, our ordinary lives, and the everyday moments to do His amazing work of grace.